After a whole lot of waiting around for seemingly no good reason, the long-delayed Texas Chainsaw Massacre prequel is finally going to hit theaters this year. And it will be here just in time for Halloween. 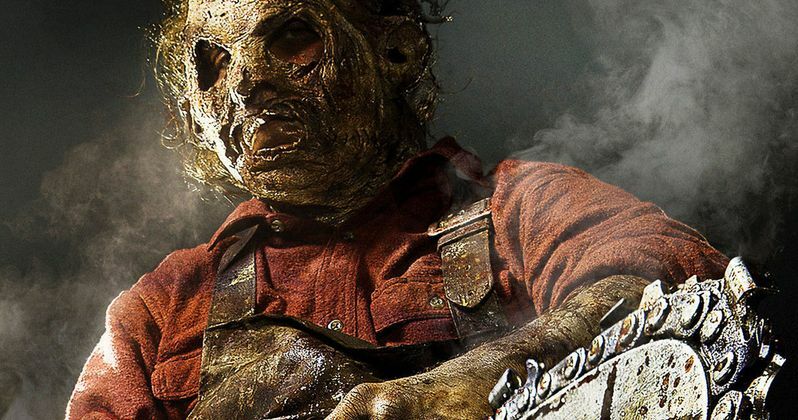 Leatherface (no, not Leatherface: The Texas Chainsaw Massacre III), which has been done filming for a very long time now and has been awaiting a release, is now set to be released this October. The news comes courtesy of producer Christa Campbell, who took to Twitter to share the news. Fans have been asking for months now as to when they can see Leatherface, because the project was announced more than three years ago and wrapped filming quite some time ago. Here's what Campbell had to say about it. "To all our leatherface fans out there. The movie will be released in October #texaschainsaw @latigrobman #Leatherface"
Leatherface is a prequel to the original Texas Chainsaw Massacre about a teenage version of the famed murderer who escapes from a mental hospital with three other inmates. The four teens kidnap a young nurse and take her on a hellish road trip. Along the way, they are pursued by a deranged lawman who is out for revenge. One of the teens will encounter tragedy and horrors that ruin his mind, turning him into the horror icon we all know as Leatherface. There was already a prequel done in 2006, Texas Chainsaw Massacre: The Beginning, but that didn't really dig into the origin story like this movie will. It is probably exciting for many horror fans to hear that Leatherface is finally making its way to theaters, but there are more than a few reasons to be cautious. For one, it is almost never a good sign when a movie just sits on the shelf after being completed. Especially since horror movies tend to be a nice way for studios to turn a quick profit, since they are cheap to produce and can rake it in at the box office. Also, exploring the origins of Leatherface may serve to sort of ruin the mystery surrounding the character, which is part of what makes him so effective and terrifying. Unless something changes, we won't have to wait all that long to figure out how this is going to go. Millennium has not yet set a firm release date for Leatherface yet, but if the movie is coming out in October, we can bet it will probably be near Halloween. The movie is directed by Alexandre Bustillo and Julien Maury with a script from Seth M. Sherwood. The cast includes Lili Taylor, Stephen Dorff, Nicole Andrews, Sam Strike, Sam Coleman, Julian Kostov, Ian Fisher, James Bloor and Vanessa Grasse. You can check out Christa Campbell's tweet for yourself below, which includes a brand new pic from Leatherface. We will be sure to keep you up to date as more information on the movie is made available.